Case 16: A 16-year-old year-round runner has had left groin pain for two weeks. The pain initially started after an 8-mile run and has gradually progressed to occur during running and occasionally with walking. Menses began at age 14 but have never been regular as she has cessation of her periods during her heavy running. She has adequate calcium intake but a history of a tibial and metatarsal stress fracture last year. She sticks to a 2200 calorie/day diet to maintain her weight. She has painfully limited internal rotation of the hip and has pain with femoral loading. Figure 13 Slipped capital femoral epiphysis. Klein's line shows slippage of the epiphysis on the left with a normal epiphysis on the right. Stress fractures of the femoral shaft and neck are not common but do occur in adolescents, especially female athletes. Females with the female athlete triad (disordered eating, amenorrhea, and osteopenia/osteoporosis) are at significant risk for stress fractures secondary to poor bone density. Runners, dancers, gymnasts, and those in aesthetic sports are at high risk for this injury. Athletes present with hip, groin, or leg pain with or without a limp. Weight bearing activities increase pain. Pain initially occurs after activity and progresses to happen during activity, with walking, at rest, and then at night. Physical examination may show a limp and pain or limited rotation of the hip especially internal rotation. Femoral loading may also increase pain. 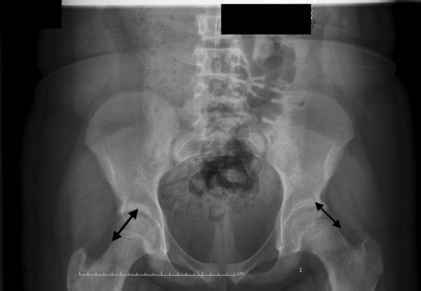 AP and cross table lateral or frog view may show a periosteal reaction or lucency suggestive of a stress fracture. A high index of suspicion is necessary as some stress fractures do not show up on radiographs for weeks. If suspected, the patient should be made non-weight bearing, evaluated with an MRI and sent for orthopedic care. Some stress fractures are stable and will heal with rest and others are unstable and require surgery. Discussion of training patterns, nutrition, menses, shoewear, and other stress injuries is necessary before considering return to sports activity. Proper calcium intake of 1500mg a day for females/1200mg a day for males should also be discussed.